Item No.201-1 Classic Fit Create your perfect look with the modern stylings of this two-button suit made from polyester and viscose fabric. Full-lined, besom pockets and side vents. Crafted in our slim fit or classic fit with notch lapels, well-finished upper armholes for added comfort and movement.Plain-front trousers. Dry clean. Imported. Item No.202-1 Classic Fit Create your perfect look with the modern stylings of this two-button suit made from polyester and viscose fabric. Full-lined, besom pockets and side vents. Crafted in our slim fit or classic fit with notch lapels, well-finished upper armholes for added comfort and movement.Plain-front trousers. Dry clean. Imported. Item No.202-1 Slim Fit Create your perfect look with the modern stylings of this two-button suit made from polyester and viscose fabric. Full-lined, besom pockets and side vents. Crafted in our slim fit or classic fit with notch lapels, well-finished upper armholes for added comfort and movement.Plain-front trousers. Dry clean. Imported. Item No.202-2 Create your perfect look with the modern stylings of this two-button suit made from polyester and viscose fabric. Full-lined, besom pockets and side vents. Crafted in our slim fit or classic fit with notch lapels, well-finished upper armholes for added comfort and movement.Plain-front trousers. Dry clean. Imported. Item No.201-19 Classic Fit Create your perfect look with the modern stylings of this two-button suit made from polyester and viscose fabric. Full-lined, besom pockets and side vents. Crafted in our slim fit or classic fit with notch lapels, well-finished upper armholes for added comfort and movement.Plain-front trousers. Dry clean. Imported. Item No.201-19 Create your perfect look with the modern stylings of this two-button suit made from polyester and viscose fabric. Full-lined, besom pockets and side vents. Crafted in our slim fit or classic fit with notch lapels, well-finished upper armholes for added comfort and movement.Plain-front trousers. Dry clean. Imported. Item No.201-3 – Slim Fit Create your perfect look with the modern stylings of this two-button suit made from polyester and viscose fabric. Full-lined, besom pockets and side vents. Crafted in our slim fit or classic fit with notch lapels, well-finished upper armholes for added comfort and movement.Plain-front trousers. Dry clean. Imported. Item No.201-3 Classic Fit Create your perfect look with the modern stylings of this two-button suit made from polyester and viscose fabric. Full-lined, besom pockets and side vents. Crafted in our slim fit or classic fit with notch lapels, well-finished upper armholes for added comfort and movement.Plain-front trousers. Dry clean. Imported. Our modern men’s suits come in slim and classic fits in a full range of colors such as navy, tan, charcoal, grey, black in wool, viscose and polyester fabrics. 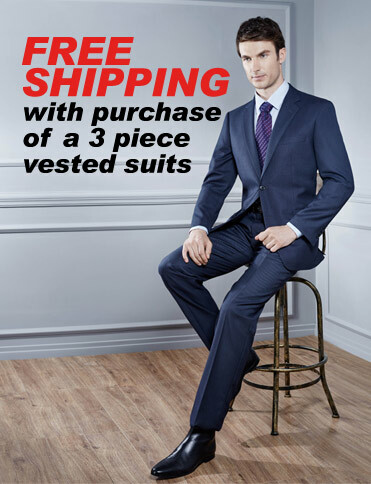 We have free shipping on all suit purchases and you can also add your accessories with your suit for free ship-ping anywhere in the US! So whether it be a special event, wedding, prom, funeral, college, interview or work we will make sure it’s perfect.